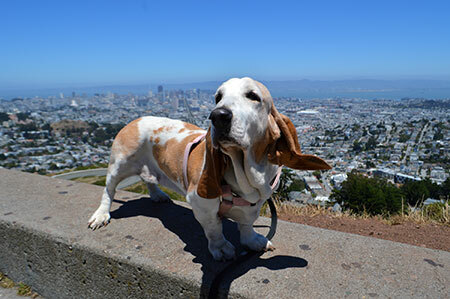 Yesterday, we put down Cleo, our beloved basset hound. She was 15, blind, deaf, and incontinent, and, having stopped eating, she was wasting away. Still, she wagged her tail whenever we got near her, even when we were changing her diaper (hard to get that wagging tail into the tail hole of the diaper, by the way). She was a rescue dog, abandoned by her previous owners after she had wandered into traffic and gotten hit by a car. You can’t keep basset hounds from wandering. Second only to blood hounds, they have the keenest sense of smell. Once they’re onto a scent, they’re gone, nose to the ground, big ears flopping as they trot, tail high and bobbing. At a glance, you could say bassets are self-absorbed, they’re so dedicated to their noses and, seemingly, not so much to people. But, once you get their attention, they can be quite affectionate. 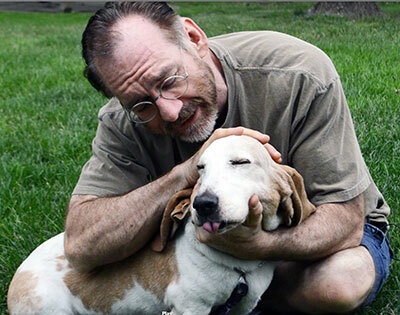 Cleo was unusual for a basset in that she was small (less than 40 pounds) and very attached to us—to me, especially. 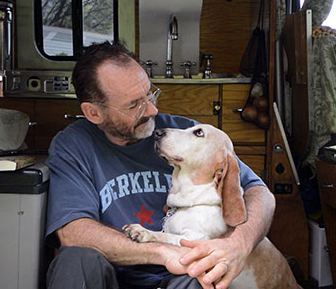 She was my travel companion on two national book tours, visiting 45 states with me in my camper van. 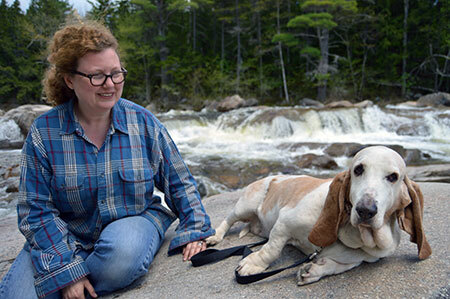 Whenever I was conducting a reading—in bookstores, lecture halls, and libraries–she was curled up close by, napping on the floor behind me. If I left her alone in the van, she’d bark and bark and bark. 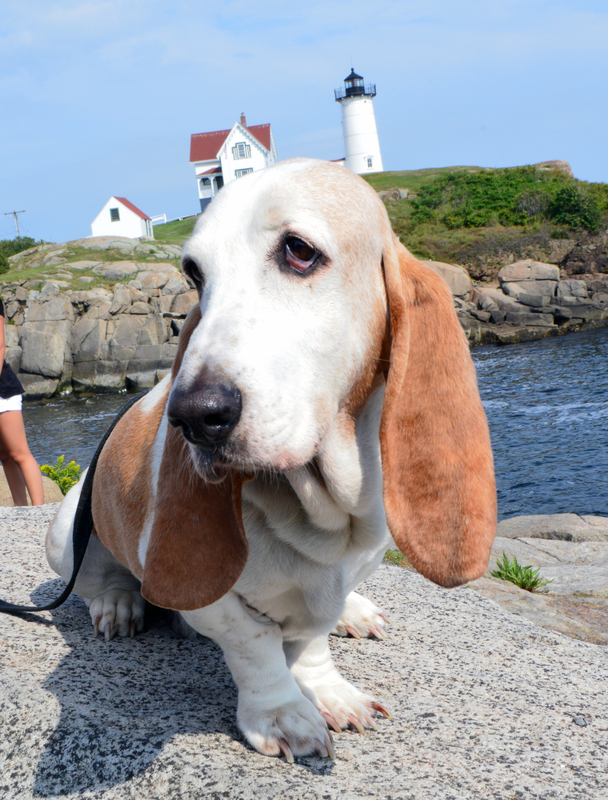 That’s one thing you should know about bassets: they bark a lot. And they don’t stop. 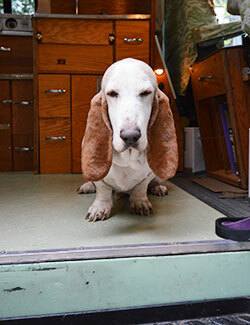 Which introduces another basset trait: they are incredibly stubborn. 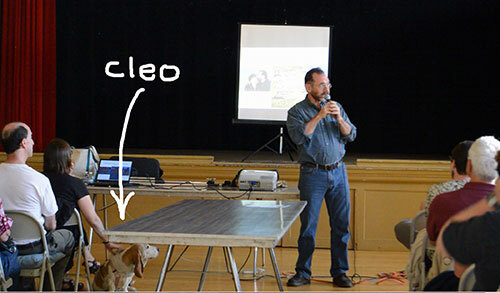 Cleo was no exception. If we tried to sequester her in a room (when company was over, for example), she would protest loudly. And she was really good at escaping any kind of confinement or barrier. We used to set up baby gates in our doorways to keep her out of certain rooms. Didn’t matter: she’d get in or out eventually, often by butting her head against the barrier until it felt or broke. I had to admire her determination. Another trait I admired was her willingness to go anywhere. On one road trip, she willingly followed me up a cliff on a hike. Because she was low to the ground, and had those big bear paws, she was able to climb slowly but surely up the steep incline. And she did so without hesitation—no trembling, no whining: she just trucked on. I could take her anywhere. And she’d sit for a photo in the most outlandish places, like the time I set her on a stone wall at the edge of a chasm overlooking the painted desert. I’ve got a video of that, Cleo with her head raised to the wind, her ears flapping behind her like small velvet flags. Oh, I loved that little dog! I know more than one person who, after losing a beloved pet, vowed never to own another–it’s too painful to lose such a companion. I am sympathetic with this reservation. But, at the same time, however short their time may be, dogs (and cats) make our world a richer, funnier, happier place. So, yeah, my little basset’s absence will haunt me for some time. And that’s how it should be, because love’s bargain is straightforward: if you love deeply, you must grieve deeply too. With this pain, then, I will take the bittersweet pleasure of my many memories and forever hold a place in my heart for Cleo.